When configuring a workflow, library administrators also define workflow validators. These are users who can perform manual workflow actions. 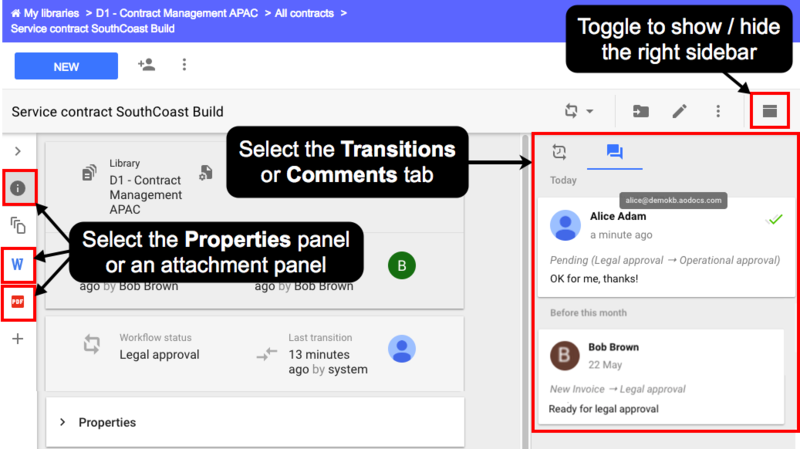 They can move a document from one workflow state to another one and leave a workflow transition comment. 1. Open a document in AODocs as a workflow validator. 2. Select the workflow action you want to perform from the Workflow menu. - The workflow menu isn't displayed if you have no workflow actions to perform on the document. - The workflow menu is grayed out if there are mandatory properties that aren't filled in, if there are properties with invalid values, or if the document has been checked out manually. 3. 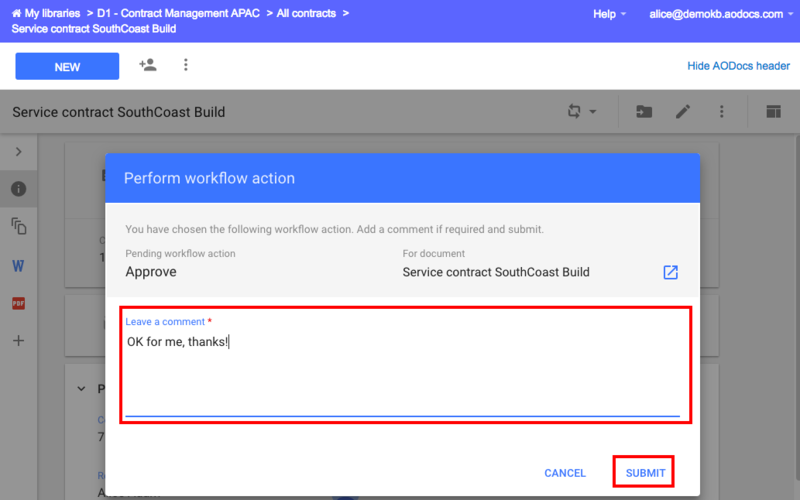 In the Perform workflow action pop-up, you can enter a comment related to your workflow action. Note: Comments can be optional or mandatory. Learn more: Configure workflow user actions. 6. 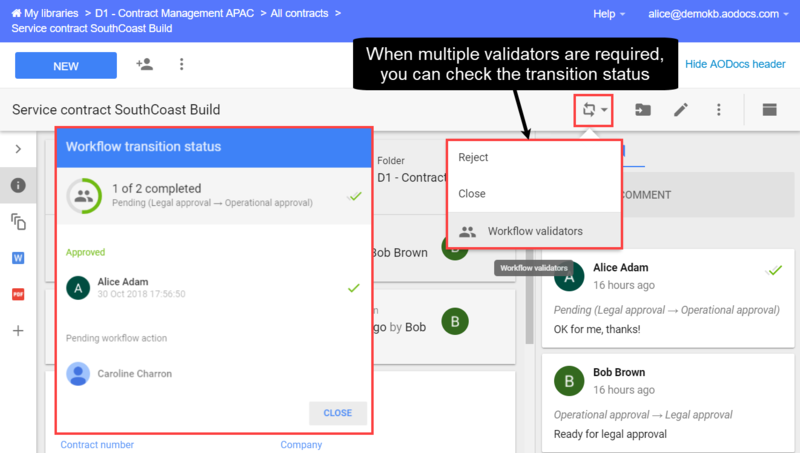 If several people need to validate a workflow action on the document, select Workflow validators from the workflow menu to check who has validated the document. Note: The Workflow validators option is available for workflow validators and administrators only. 7. 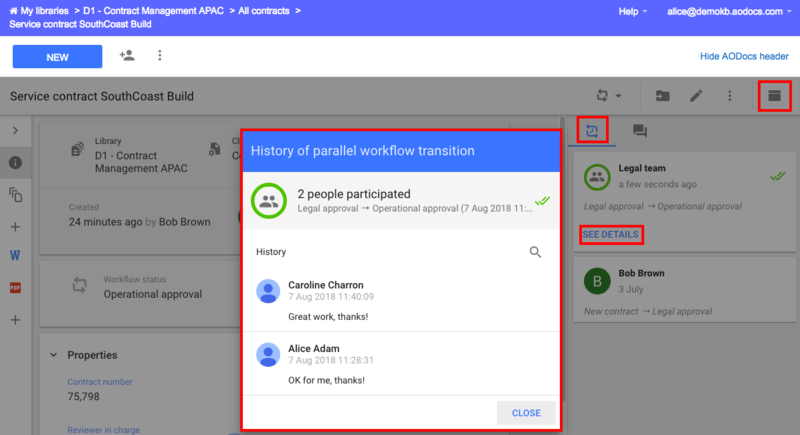 Once the workflow transition is completed, you can open the Transitions tab and press See Details in the box showing the completed transition to see the history of the workflow transition. 1. Open a view in AODocs as a workflow validator. 2. Select one or more documents in the same workflow state. 3. Select a workflow action in the Workflow menu. - The workflow menu isn't displayed if you have no workflow actions to perform on the selected documents or if you selected documents in different workflow states. 4. The Perform workflow action pop-up opens. 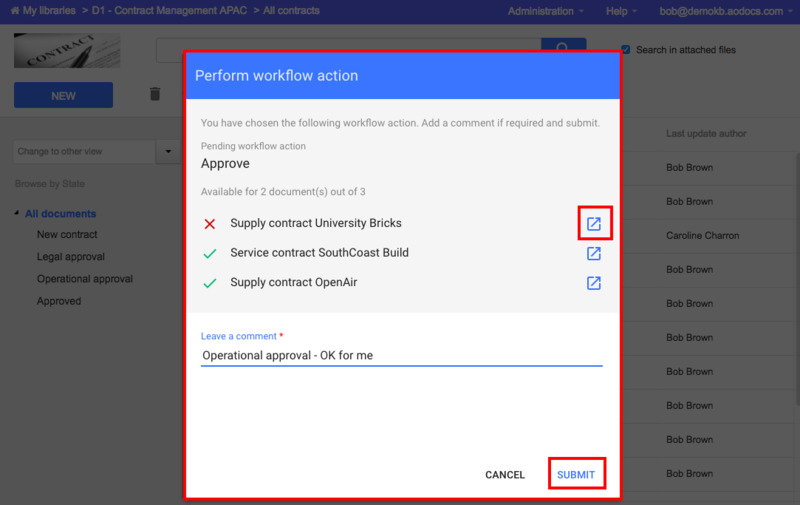 If you selected more than one document, the Perform workflow action lists the documents in which you are about to perform a workflow action. Note: A red cross is displayed next to documents that can't be transitioned (documents with mandatory properties that aren't filled in, with properties with invalid values, or if the document has been checked out manually). 6. The Processing workflow transition pop-up opens. 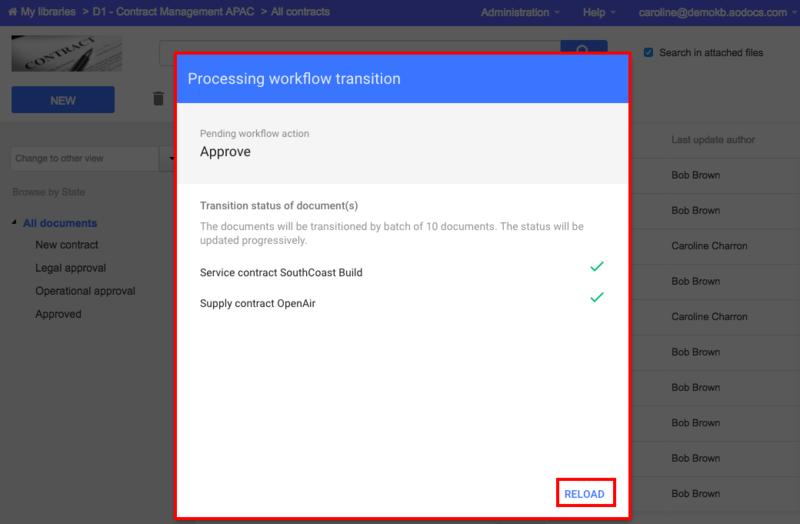 The workflow transition is processed in batches of 10 documents at at time. Note: The documents marked with a red cross in the Perform workflow action pop-up are not processed. 7. Press Reload to return to your view.